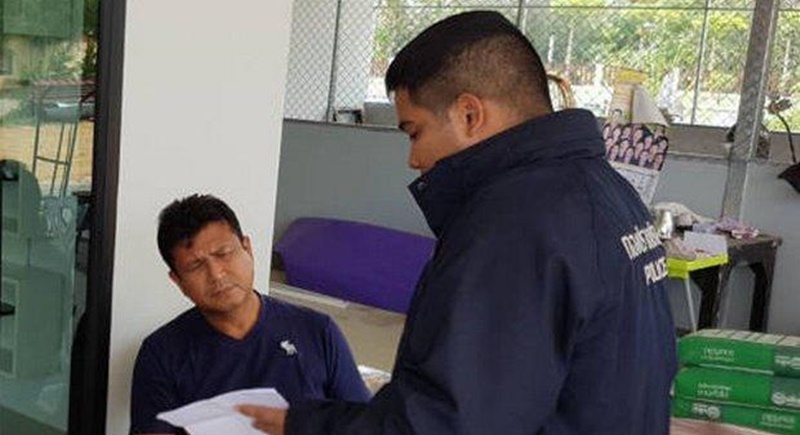 BANGKOK: Police have apprehended a former officer who goes by the nickname Ja Hin Muang Phet and who has been on their wanted list for years on murder charges after he left the force and became a hitman working for criminal elements. A Crime Suppression Division (CSD) team finally nailed former Sgt Maj Anan Hincheeranan, 47, this month. He is not the first former Royal Thai Police officer who has turned to a life of crime and opted to make a living by robbing other people of theirs. Ja Hin is believed to have been involved in several murder cases. His arrest comes as he was allegedly attempting to form a criminal ring after having gained notoriety for being a “reliable” and “fearless” hitman. His growing notoriety soon caught the attention of CSD spies. This led to a special team being formed led by Lt Col Sarawut Chantawong, an inspector with the CSD’s Sub-Division 1, to track down this “rising star” in Phetchaburi. Ja Hin started his so-called rise to fame after he was prosecuted in a 2004 murder case, in which he gunned down a security guard at a night entertainment venue in Phuket simply because the guard said something he didn’t like. The guard died instantly at the scene and Ja Hin was dismissed from his job. Lt Col Sarawut said he began tracking him years ago when the detective was still working at the Metropolitan Police Bureau’s investigation command. He got closer to his prey in 2012 when he was assigned to a case that involved a shooting ambush on a Mercedes-Benz on Soi Phahon Yothin 32 on June 22, which resulted in three people being wounded. The motive behind the attack was found to be a conflict within a drug-trafficking network. Adisak Thongho, one of the injured, was found to be involved with a major drug gang that was busted in May of that year, said Lt Col Sarawut. The attack on the occupants of the car was thus motivated by revenge, he said. Some spent shells from the crime scene eventually led the police to a hitman who belonged to a ring operating in Phetchaburi. Further investigation showed the hitman and his assistant had used a motorbike and had been used in several previous hits. One of the earlier hits was allegedly ordered by Somporn Sriwatthanakulporn, 48, a major drug dealer in the Central Plains. She reportedly asked Manoch Butnamphech, 46, a drug inmate at Bang Kwang Central Prison, to find her a hitman to kill Adisak. Somporn was under the impression Adisak had betrayed her drug-trafficking network, which resulted in a police crackdown on it in 2012. Manoch then reportedly contacted Ja Hin, who asked his younger brother, Noppadol Hincheeranan, to contact Sakraphop Khlaikhleung, 44, a gunman, and Sarawuth Siangyai, 27, the motorcycle driver. They allegedly accepted the job. Thasanon Thong-asa, 27, a key witness who claimed to know the details behind the attack, was later killed by the same gang near an inter-provincial van station on Mattayawong Rd in Phetchaburi after being lured there under false pretences. Somehow, the gang had learned that Thasanon had become a “person of interest” to the police in their investigation into the June 22 attack. They had decided it was safer to wipe the witness out. Unfortunately, not long after the murder of Thasanon, Sarawuth, the motorcycle driver, was detained by the police in Prachuap Khiri Khan, where he had gone into hiding since the attack. Sakraphop, the gunman, was later killed in a gun battle with police as they tried to arrest him at the Mo Chit bus terminal in Bangkok in the early hours of June 11, 2012. He was aiming to travel to Phitsanulok’s Phrom Phiram district, where one of his relatives lived, and where he would have continued to hide out had the authorities not found him first. But Ja Hin was apparently not affected by this case or the police investigation into the June 22, 2012 attack. He remained at large for years until Lt Col Sarawut recently picked up his trail. The detective recently learned Ja Hin was hiding in Prachuap Khiri Khan, where he was able to operate freely and even run a real estate business. Lt Col Sarawut sent a spy to contact Ja Hin, pretending to be a potential home buyer. Realising Ja Hin was alone at that time and appeared to be unarmed, the spy signalled for the police to rush in and arrest him. With Ja Hin safely in police custody, a manhunt for Somporn and Noppadol was set in motion and remains under way, said Pol Lt Col Sarawut. 'Spies'? I take it this is a literal translation from a Thai news atrile. One would thing 'undercover', 'plain clothes' or 'informant would be a better description. 'Amazing' that he was able to hide in plain sight in PKK- one wonders how the plot may thicken.